It is Friday in Las Vegas, the city that really doesn't sleep. And I thought NYC had the hold on that statement. It seemed like most people were going to be when we were getting up at 7 am. The best part of the conference for me so far, has been the expo hall. There are a lot of products and services I have been wanting to learn more about. The best place for me to do that is here. I am kinda excited to try out a few new toys when I get back to DC. Session! Have been slow coming for me. I did catch a the end of an awesome session that Beth Kanter was a part of with Clare (@hope140) from Twitter. It wasn't anything too new for me personally, but they did provide some nice tips for organizations. "We make many mistakes; social media is forgiving if you are real"
It is simple for nonprofits to excel in twitter; just follow Clare's 5 steps: T.W.E.E.T. Write - Tweet! Get your worlds and thoughts out there. See what works! If it doesn't work, change your strategy. Engage - Get people interested in what you are saying. Jump in in conversations. Favorite tweets and retweet. Engage with your followers. My biggest pet peeve when organizations don't do this!! Explore - Search! Search for when people are talking about you and the issues that you are connected to. That is how people notice you. Good way to do this? Influencers. Develop relationships with key influencers, media, etc to eventually help promote your cause/issue. Track - If it is working, then you need to learn how to simplicity. Depending upon your job, so it takes 30 minutes to 1 hour to manage your tweeting. I cannot believe I am about to post this, but we test drove a Ford today. Thanks to the TWiT, Joel hears about Leo's car with Sync all the time. Since Ford is a major sponsor here, we decided to learn more about sync and to see if it does what we are looking for. The main thing is that we want to be able to control our iPhone's through the car and have an integrated navigation system. Both of which we saw could be accomplished through their demo of sync on the show floor. So I signed us up for a test drive. Yup, I am a sucker. If it is well made and does what I want it to do, then I am sold. Tomorrow we are going to test drive the Edge which is another car they have. 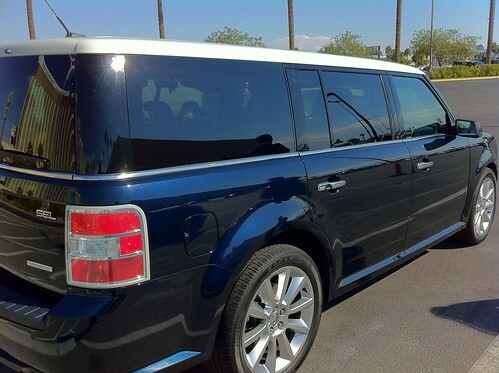 The Flex, although rather nice, is just way too much car for us. Joel wants the Focus, I am pushing for something bigger. The Edge may just be the compromise we need. Plus, it has the new sync features in it that I want to demo. This panel was interesting to me because, well, I am trying to decide if I want to stick with Squarespace. Do I pay for a designer or do I totally switch? The facilitator is the head honcho at Woopra, which I love. Future proofing your blog. The constant battle of staying up to-date. It is something that I am currently struggling with day in and day out. What should I be doing, especially when I feel my current platform isn't giving me the support it feel it should. The best and worst part is the session never covered that. It did lead to a very interesting conversation with John Foster afterwards. We met John way back in '08 when visiting San Francisco and loved bumping into him during the session. Our conversation revolved around who actually owns the content on a blog if it isn't self-hosted. That really made me reconsider using WordPress and our server. Then, a Squarespace rep came over to talk to use because he recognized us from our many twitter "conversations". What he said about V6, which will be (fingers crossed) rolling out shortly, is making me rethink everything. I don't have the best answer yet, but I have a feeling I should wait it out and see. I am very intrigued by what he had to say (which I can't share here, sorry! ).